Which set you choose (Raavad or Rambam) depends on how you plan to tie the tzitzit. To tie according to the Vilna Gaon, Sefer HaChinuch, Amram Gaon or the Raavad, choose Raavad. This set comes with three white strings and one blue string for each corner. To tie according to the Rambam or the Arizal, choose Rambam. 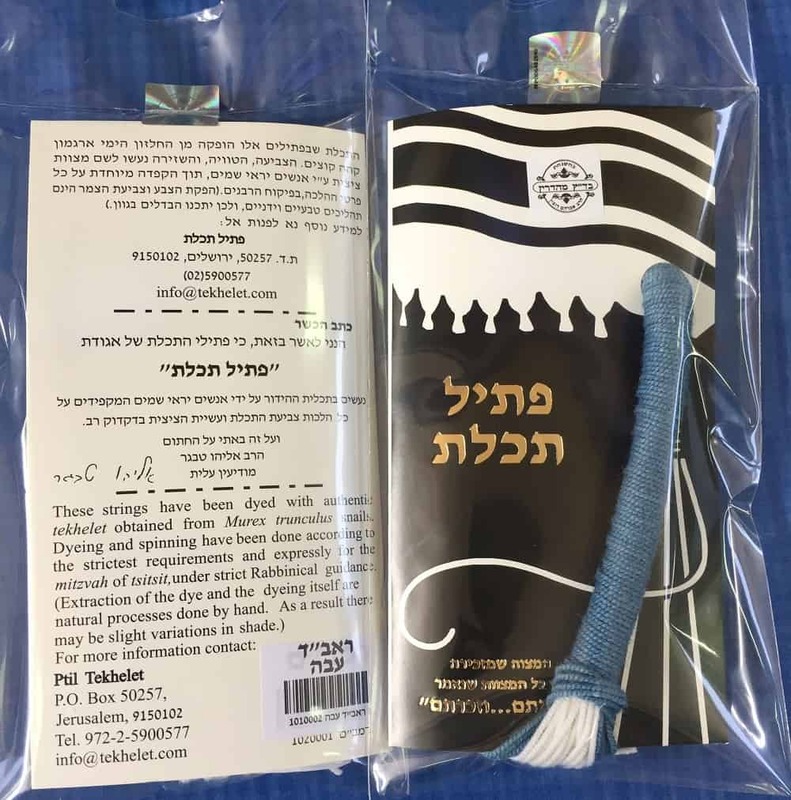 This Ptil Tekhelet set comes with three white strings and one half white/half blue string for each corner. Rambam Rambam with 13 chulyot, Chabad/Arizal, "Sephardic"
When it comes to tekhelet, Ptil Tekhelet is 99% the best! took awhile to tie it and it looks great. I've been using Ptil Tekhelet strings from the Murex for years, and will never use anything else. Great quality on all religious items and excellent service. A hand full in our minyan where Ptil Tekhelet on our tallith. We're pushing the issue. Personally, I would have great difficulty with wearing a Tallit which did not have Ptil Tekhelet strings. It is a fundamental part of the mitsvah, in my opinion. One packet recently purchased did have a frayed white string but from experience, this is unusual. I tasked Ben to procure long thick Techeles to be tied according to Tosfos, with Rav Hershel Schachter’s 7 x 7 Rokiah preference and the opinion of the Baal Hoittur which Rav Schachter also suggests. The tying was perfect and the service was quick, even to Australia. Very happy with my tekhelet. Great service and product. 7 days delivery time to the uk is good but could be better. Will likely buy my next set from here again. Expertly crafted with beautiful rich blue-violet color. The shipping thing-according to me-was great too.